Today I found out the official Olympic salute strongly resembles the “Heil Hitler” or “Nazi” salute. In this Olympic salute, your right arm should be held out, slightly to the side, and pointing in an upward angle. Likewise, your palm should be out and your fingers touching. The Nazi salute is more or less performed the same way, except it is customary to hold your arm straight in front of you, instead of partially to the side. As you might imagine, the Olympic salute fell out of favor after WWII. Despite this, the International Olympic Committee hasn’t yet replaced it with a different salute, even if nobody would dare use it anymore for fear of being misinterpreted. The similarity of the salutes ultimately led to a great deal of confusion during the 1936 Olympics in Berlin over whether many of the non-German teams were saluting Hitler using the Nazi Salute or whether they were using the official Olympic salute. This even fooled German audience members who sometimes misinterpret the Olympic salute given by some teams as the Nazi salute and subsequently cheered more for those teams as they passed, such as the standing ovation the French team received when they gave the misinterpreted Olympics salute. Because the same confusion came up during the Winter Games a few months before, Britain decided to abstain from giving any kind of salute, so as not to be misinterpreted as saluting Hitler with the Nazi salute. They marched in a procession once around the arena, saluting the dais, each nation, according to its custom, as they passed; then, turning across the field, they took their stand in columns great and small in front of the Fuehrer and the guests of honor, their flags at their head. The Turks were the only team to give a military salute throughout. The Bulgarians drew down handsome applause by flattering German sympathies in a double way. They goose steeped past Hitler and gave the Nazi salute to boot. The New Zealanders evidently mistook an erect German athlete in white who stood out in front, far to the left of the stand, for the Fuehrer himself, for they removed their hats for this outstanding figure and put them on again while passing the dais. Some teams apparently did not know the difference between the Olympic and Nazi salutes and rendered mixed homage. The Nazi salute was given by Afghanistan, Bermuda, Bolivia and Iceland, besides, of course, Italy which originated it, and the Germans. In general the salutes stood about equally divided between the Olympic and Nazi, but “eyes right,” was common to all. The Americans provided their own special salute by giving eyes right and placing their straw hats over their hearts. This salute also was adopted by China and the Philippines. 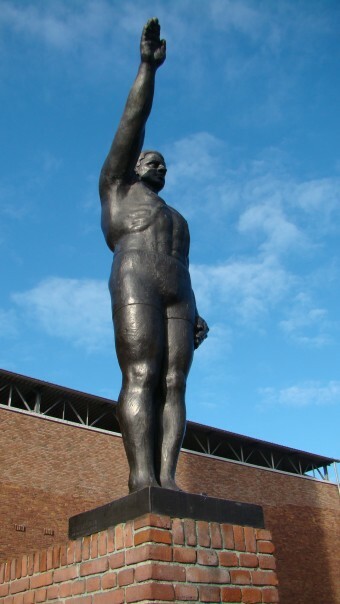 Both the Nazi salute and the Olympic salute are thought to be based on a supposed Roman salute, though no actual Roman text or artworks that describe or show it have survived. Despite this, in the 19th and early 20th century it became very popular in plays, artwork, and movies to portray this “Roman” salute. This soon resulted in it being adopted by the Italian Fascist Party and then the Nazi Party. This was not without controversy within the Nazi Party as many didn’t like the fact that their salute was influenced by the Italian Fascist Party. In true Nazi form, an attempt was made to fabricate a new history which predated the Italian Fascist Party’s use of the salute, to make it appear the Italian Fascist Party was influenced by the Nazi Party in terms of the salute, rather than the other way around. I made it the salute of the Party long after the Duce had adopted it. I’d read the description of the sitting of the Diet of Worms, in the course of which Luther was greeted with the German salute. It was to show him that he was not being confronted with arms, but with peaceful intentions. In the days of Frederick the Great, people still saluted with their hats, with pompous gestures. In the Middle Ages, the serfs humbly doffed their bonnets, whilst the noblemen gave the German salute. It was in the Ratskeller at Bremen, about the year 1921, that I first saw this style of salute. It must be regarded as a survival of an ancient custom, which originally signified: “See, I have no weapon in my hand!” I introduced the salute into the Party at our first meeting in Weimar. The SS at once gave it a soldierly style. It’s from that moment that our opponents honored us with the epithet “dogs of Fascists”. Do Olympic Medalists Receive Cash Prizes With Their Medals? To make matters worse, when Owens arrived at his own reception party at the Waldorf hotel after a parade, he was not allowed to enter via the main doors and also was not allowed to use the normal elevators, once inside. Instead, he had to use a freight elevator to get to his own party. “The sportive, knightly battle awakens the best human characteristics. It doesn’t separate, but unites the combatants in understanding and respect. It also helps to connect the countries in the spirit of peace. That’s why the Olympic Flame should never die.” Hitler was already planning what would become WWII when he said these words during the 1936 Olympics. Today using the Nazi salute is a criminal offense in Germany, along with Austria, the Netherlands, and the Czech Republic. In Germany, even the written form of the salute is technically a criminal offense. The punishment for performing the salute or writing or drawing it can be up to 3 years in prison. The exceptions are using it for educational purposes or in parody, so long as the parody is making fun of or being critical of Hitler and/or the Nazi Party. This parody exception is highly risky to execute though. For instance, in 2007 Horst Mahler was given a six month prison sentence for giving the Nazi salute to the prison guards upon reporting for a nine month prison sentence he had already been given in an unrelated matter. A brain damaged man, Roland T, in 2007 named his dog Adolf and trained him to give the Nazi salute with his paw anytime he heard someone say “Heil Hitler”. Roland was given five months in prison for this and his dog was renamed and trained not to do this anymore, before being given to new owners. This is lucky for the dog, as Roland claimed he had planned to kill the dog on the anniversary of Hitler’s death. Jesse Owens is thought to have been the first black American athlete to be sponsored by a company, with Adidas’ founder Adi Dassler convincing him to wear their shoes. I was always under the impression that the nazi salute was a form of the imperial roman military salute. But I can’t be bothered to google it, so just disregard my possibly useless facts. Actually – the “Hitler Salute” was invented in America!!!!!!!! Hitler saw it – liked it and used it!!!! It was used to say the Pledge of Alligence to the flag and the salute was known as the Bellamy Salute. In the later 1930’s the Bellamy salute was dropped in America in favor of the “Hand Over Heart” salute!!! In addition, the bogus Hitler quote from that book then indicates that Hitler and most Americans suffered from the same ignorance because Hitler allegedly says “It must be regarded as a survival of an ancient custom…” a common myth repeated everywhere and for which there is no evidence whatsoever. The Smithsonian article is incorrect in stating that “…19th and 20th century artwork all portrayed Romans doing it [the salute].” The concept of the “ancient Roman salute” did not even exist until around 1920, decades after US children had been led in the mechanical chanting in government schools (the pledge began in 1892). (see the etymology of the term “Roman salute,” i.e. the Oxford English Dictionary). There is a 19th century work of art that has been deliberately misinterpreted/misrepresented by people who want to cover up the Pledge of Allegiance as the origin of the gesture. Even the artist himself did not use the term “Roman salute,” and neither did Francis Bellamy, author of the Pledge of Allegiance, who explained clearly the origin of his gesture, and it had nothing to do with any “Roman salute” myth. Bellamy’s original chant began with a military salute that was then extended outward to point at the flag (thus the stiff-arm gesture came from the pledge and from the military salute). In practice, the military salute was merely extended out to point at the flag with the palm down (there is film footage showing this, but the Smithsonian will never display or explain the film footage). That is another reason why the Smithsonian and Americans will never tell the truth about the pledge: they believe it disparages the military and the military salute as the origin of the Nazi salute and Nazi behavior. The spread of the US’s early pledge gesture was aided by early American films depicting made-up Roman scenes (toga films) that used the early American stiff-armed salute (that also shows how the American stiff-armed salute was spreading outside of the Pledge and outside of government schools -socialist schools- into a common/popular gesture or greeting even in the USA). The pledge continues to be the origin of Nazi behavior even though the gesture was changed to hide the pledge’s putrid past. It is bizarre that it continues to exist (though the stiff-armed salute was altered) and that intelligent(?) adults have been duped into the mechanical propaganda chanting. Your article is wrong. The US’s Pledge of Allegiance was the origin of the stiff-armed salute (see the work of the historian Dr. Rex Curry). You are correct – it was called the Bellamy Salute and was dropped in teh early 1930’s – in favor of the hand over heart salute!!!!! !